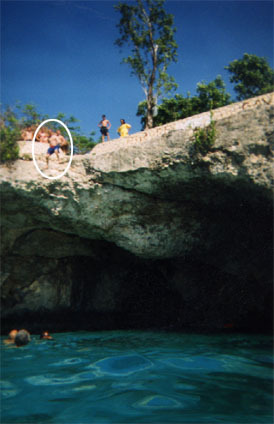 This is the cliff jumping part of the trip. That's M.J. jumping in this photo. This cliff was by the Pickled Parrot and I think it is about 35 feet high. The water is about 25-30 feet deep here. Jim made 2 jumps. Both of which were beautiful!